Whether you are a serious competitor or just plain serious about the bagpipes you play, our choice of instruments harness luxurious refinement and unrivalled craftsmanship with uncompromising sound quality that only a set of McCallum Bagpipes can produce. Every budget is catered for in our exclusive collection of bagpipes. You need Adobe Flash Player to view this video. You can watch more videos featuring McCallum Bagpipes on our YouTube channel. To find out more about the bagpipes in our collection and see the high level of detail and craftsmanship that goes into every set of McCallum Bagpipes, we invite you to view our full colour digital brochure. 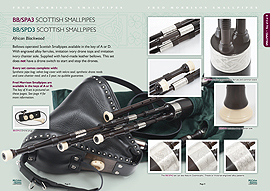 Please contact us for further information on our range of bagpipes.